Queen Sofia of Spain is the wife of King I. Juan Carlos who remained on the throne from 1975 to 2014. Princess Sophia of Greece and Denmark was born on November 2, 1938, in Psychiko, Athens, Greece, and is the eldest child of King Paul and his wife, Queen Frederica. Juan Carlos and Sofia married on May 14, 1962 at Saint Dionysius Catholic Cathedral in Athens. Sofia converted from Greek Orthodoxy to Roman Catholicism and thus relinquished her rights to the Greek throne. Happy 79th birthday to you, Queen Sofia. Parabéns Rainha Sofia :). Bela fotografia e um belo vestido. 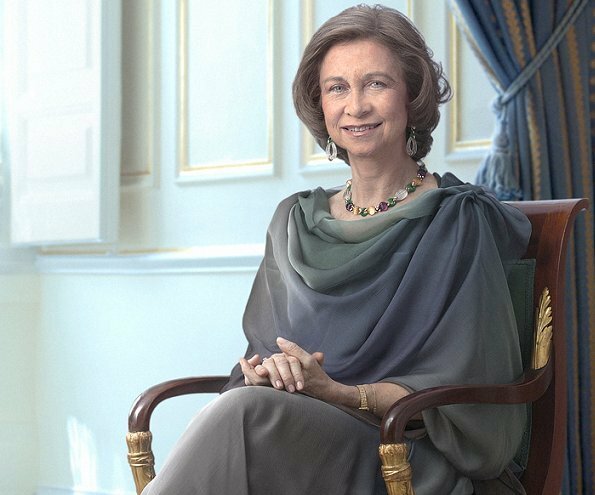 Beautiful picture of Queen Sofia … it looks almost as a historical/classic painting. Beautiful photo. Leonore gets very much after her grandmother. This is exactly what I thought when I saw the picture, Blondiini. I always wondered whom she resembles most and this pic looks like an older version of Leonor. My very thought, when I saw the protrait of Queen Sofia. Very touching, they both look so delicate and tender-hearted. Feliz Cumpleaños, Señora. Bonita imagen, pero con demasiado photoshop, que no era necesario porque se conserva muy bien. Beautiful photo. She looks very elegant. H.M.QUEEN SOFIA IS SO RADIANT AND REGAL. LOVED AND ADORED IN SPAIN AND GREECE. EXCELLENT MOTHER AND UP TO HER HIGH DUTIES, DEVOTED TO HER VOWS I WISH HER VERY MANY HAPPY RETURNS FOR VERY MANY YEARS TO COME. THE WORLD DESERVES PEOPLE LIKE H E R .
Totally agree!She's one of a kind. Why are you Anna shouting so loud, it is impolite? Just lovely. Such a lovely elegant Queen!